Starry Kitchen proprietor Nguyen Tran wants you to put his balls in your mouth. He's not shy about it, either. A couple weekends ago, you could find the affable restaurateur with the penchant for goofy costumes sporting faux lederhosen and a clapboard sign entreating you to enjoy his balls. No, not those kind of balls. 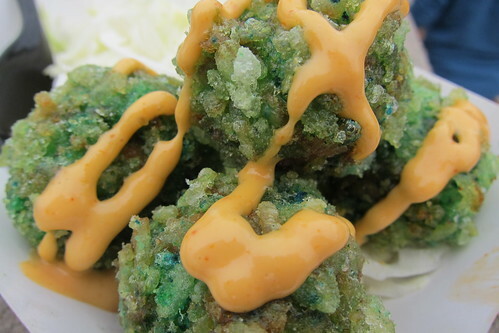 Nguyen and his wife Thi (he handles front-of-the-house; she oversees the kitchen and develops recipes) have perfected a green, deep-fried tofu ball that's as fun to look at as it is to eat. 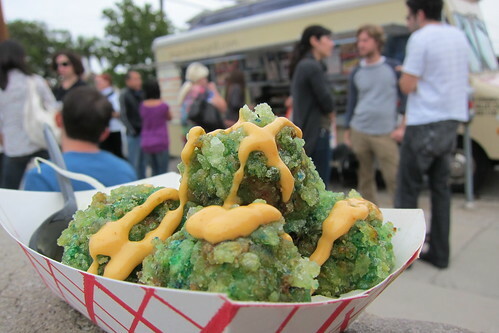 At the LA Street Food Fest in July, Starry Kitchen ran out of the popular tofu balls before I could try one. When I heard, a couple weeks ago, Starry Kitchen would be hawking their wares from the Mandoline Grill truck as part of a pairing with wine store Domaine LA., I queued up. Made from tofu that's pressed overnight to drain excess water and then marinated, dipped in buttermilk, coated in a green, glutinous rice from northern Vietnam and deep-fried in cottonseed oil, they come drizzled in a creamy, spicy sauce. They're simultaneously hearty and delicate, crisp on the outside but pliant when you sink your teeth into them. The flavor is subtle, a bit nutty with a hint of sweetness that's easy to miss under the sriracha mayo. They're an ideal size for snacking, which gives rise to all sorts of innuendo as you keep popping Tran's balls into your mouth. That's what she said.